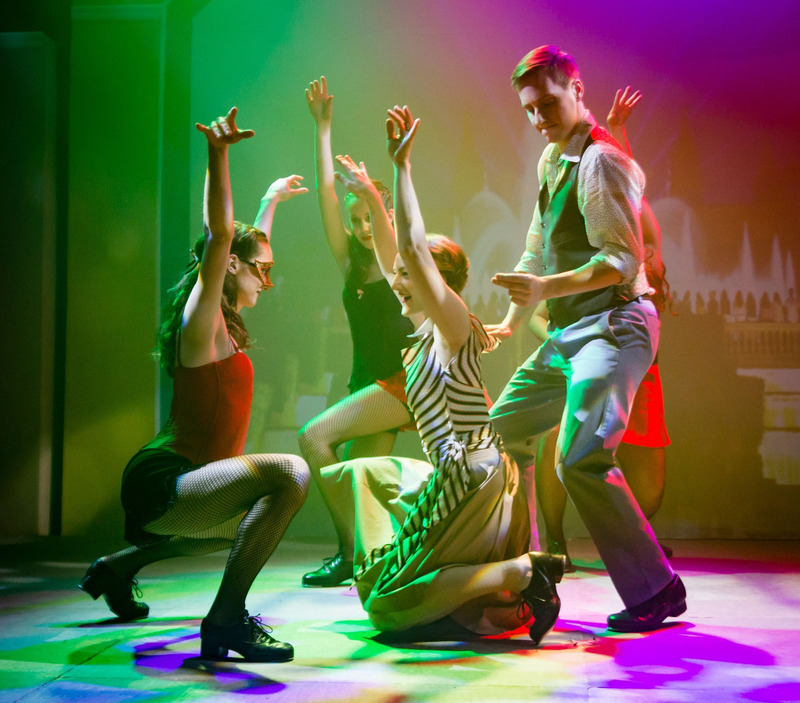 CHICAGO — Each season, Chicago Tap Theatre (CTT) runs a fairly formulaic series of performances. There’s the holiday tap jam Tidings of Tap, a one-nighter at the Athenaeum, and a full-length narrative, usually staring the company’s Artistic Director and Business Manager, husband and wife team Mark Yonally and Jennifer Pfaff Yonally. While the content of each “tap ballet” is different each year – thanks to the wildly imaginative Yonally and his creative team – there is a charmingly nerdy wit to each one (Yonally should, and likely will, take that as a compliment). Perhaps that’s just what happens when you tell stories with your feet, and for two weekends at Stage 773 this season’s Time Steps is certainly no exception. All the usual suspects are present: the Yonally duo and dancers Kirsten Uttich and Isaac Stuffer in their roles as the lovable side kicks, plus live original music from Kurt Schweitz, who plays nearly every instrument and in this case is accompanied by a flutist and cello. But while Time Steps occasionally gives off a “same, same” vibe, there are some key differences between it and the other tap stories CTT has made. The Pro theater at Stage 773 was dressed up with a very beefy light kit, with Dustin Derry’s psychedelic designs at the forefront. Most noticeably different, though, is narrator Marc Kelly Smith, who guides us through the story he wrote by posing as a salesman (or, swindler?) peddling magical cards. Yonally’s character, a millionaire’s son, tempts fate by “playing” these cards throughout the evening to sway the universe to his bidding like wishes granted from a genie’s lamp. In the process, he travels through various times and locations in pursuit of the sometimes sweet, sometimes sassy Carla (Pfaff Yonally). But as the raspy voiced Marc Kelly Smith reminds us thrice, his cards do not come with guarantees, and the couple don’t, actually, live happily ever after.